Lady Lucy Gilbert loved her flowers. Having planted the formal garden at Grim’s Dyke, along with the sunken rose garden, she ensured there were always beautiful and colourful flowers to break up the seasons. Dotted amongst the roses in the sunken garden, Lady Gilbert had planted both Geraniums and Alliums. Alliums are part of the large Amaryllidaceae family and belong in the Alliodeae subfamily. This family includes Amaryllis, daffodils, agapanthus, and snowdrops. The Amaryllidaceae family was created in 1805 and has approximately 1600 species in it, split into 75 genera, 17 tribes and three subfamilies. What’s interesting about the Allium family is they comprise of both ornamental Alliums and vegetables! Onions, shallots, scallion, chives, leeks, and garlic are all part of the Allium family. The vegetables and flowers in the Allium family all have the immediately obvious onion smell and taste about them. Commonly known as ornamental onions, Alliums are equally beautiful in the flower garden, adding height and variety to any border. Even once the flowers have died, the skeletal seed heads produce a striking display. Swedish botanist Carl Linnaeus, first described the genus Allium in 1753. It’s a difficult species to label correctly. Some reports state there are 260 different varieties within it; others state it’s as high as 979. Flowering from Spring right through to mid-summer, Alliums can grow up to 6 feet tall and have a spread of up to 1 foot. They’re relatively easy to grow and they only need dividing if they get overcrowded. It’s understandable that Lady Gilbert planted them amongst the roses, as when an allium dies back, the leaves wither and look quite bedraggled! Planting them amongst other plants helps mask them, once they reach this stage until they grow again the following spring. With so many flowerheads on each plant, Alliums are perfect flowers for bees and other pollinators. The Globemaster Allium especially is not only striking to look at, with its incredibly large flower head (it’s six to eight inches across! ), it’s also a rich source of nourishment for pollinators. Because of their striking appearance, Alliums are known for their architectural qualities. They have rich colours, an intriguing sphere of flowers at their head and this sits upon a long sturdy stem. 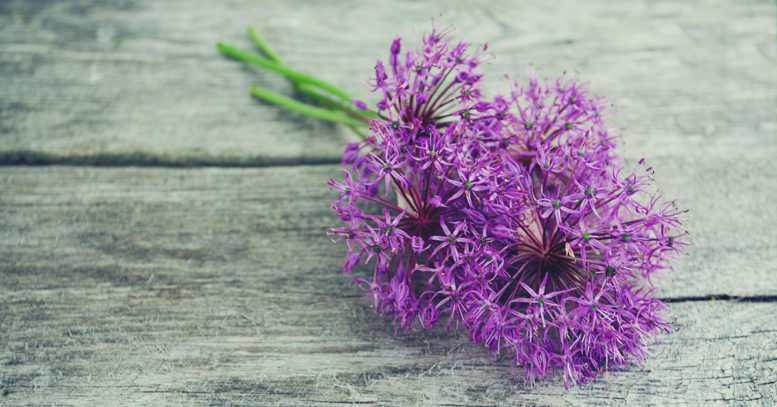 Ones of note include ‘Purple Sensation’, which has received an Award of Garden Merit, the Globemaster, with its huge flower head and the Karataviense AGM – a low growing Allium with delicate pink star-shaped flowers and greyish purple leaves.